Hidenori Otake proved no match for Isaac ‘Royal Storm’ Dogboe who sent out a strong warning to other contenders in the junior featherweight division with a devastating round one destruction of the Japanese veteran for a first successful defence of his WBO world title at the Gila River Arena in Glendale, Arizona on Saturday night. Dogboe who first won the title with an equally impressive performance to hand a first career defeat to highly rated Mexican-American, Jessie Magdaleno in Philadelphia in April, was even much quicker and ruthless against Otake, the 37 year old Oceania Pacific super bantamweight champion who was hitherto undefeated in nine fights dating back to his only previous world title challenge in the UK in 2014. Dogboe rattled Otake with heavy body and head shots in the two and half minutes or so the fight lasted, flooring the Japanese twice amid continuing with the punishment until referee Chris Flores reckoned he had seen enough to wave off the fight at barely 2:18 of the very first round to hand Dogboe the 20th straight victory of his still burgeoning pro career, backed by 14 knokouts. You can only beat the man in front of you and that’s just what young Dogboe did agaisnt Otake who had earned his shot as number 6 in the WBO world rankings as well as top 10 in all the other sanctioning bodies and was undefeated in four years before last night. 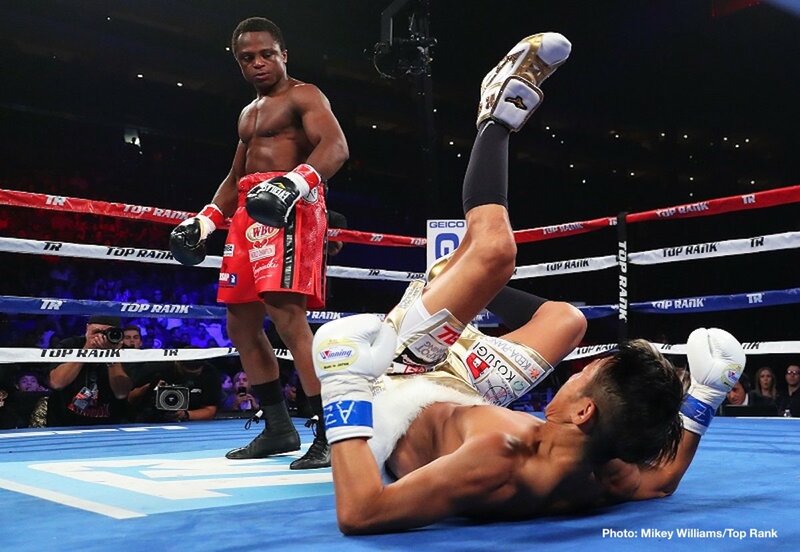 Dogboe however took him to to cleaners, dominated him and took him out to further enhance his own rising credentials as the king of the super bantamweight division. And to underline his readiness to take on the very best in the world, the 23 year old Ghanaian called out the 122 lbs world title holders specifically Rey Vargas (32-0, 22 KOs) of Mexico who holds the WBC super bantamweight belt and WBA champ, Daniel Roman (25-2-1, 9 KOs). The IBF champion is TJ Doheny of Australia who has an identical record to Dogboe (20-0, 14 KOs) and won the world title only ten days ago, August 16 by dethroning previous champ, Ryosuke Iwasa of Japan in Tokyo. “This was a great performance. I’m glad I got to showcase my skills on ESPN. I’m very thankful for the opportunity. I have a lot of respect for Otake for standing up after getting dropped. When I hit him with that powerful hook and dropped him the first time I felt the holy spirit,” Dogboe said at ringside after the fight. “Now, I want to face all the champs. Lets do this. I’m ready to unify all the titles. I thank Hidenori Otake for signing the contract to make this fight because all these champions out there, my team called them, we spoke with them but they failed to sign the contract” Dogboe explained. “But there is a new kid on the block, Isaac ‘Royal Storm’ Dogboe, the warrior of Africa, the 122 division so all you champs out there in my division, come let’s put it on, Rey Vargas, Daniel Roman, wherever you are, come out, let’s do this,” Dogboe called out.